saw no hesitation or show off or superiority complex amongst volunteers with a reference to their personal circle inside the venue all were onto any work at hand, No one uttered ‘ I can’t do this’ phrase anywhere and they did the task at hand nicely. I had a personal disappointment though since there was no spot registration in this nakshatra. As a overall literary team coordinator I experienced situations wherein my team volunteers asked me if they could add names of kids since the name was not on registration I asked people but they said no and that left me with a slightly hard heart and a few tears on their side; so a change should be made in that. 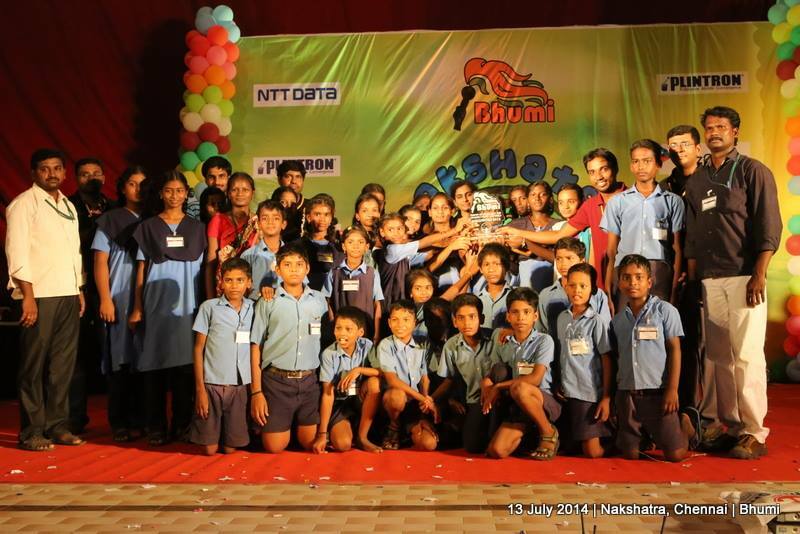 Winners of Nakshatra 2014 Bangalore – Child Fund Association receiving the trophy from Gnanmbigai. Dr.Prahalathan, Ganapathy and Arshath are also seen. And when it was group dance on the stage it was not just kids dancing up on stage; Volunteers too shook their leg in tune by radiating all the innocence inside them. It was a best moment of the day. And as usual prizes were distributed to kids at the end. On the whole it was never like an event organised by Bhumi in Care College rather it reverberated in the kids to say “It was the happiest day of life with a lot of enjoyment”. A few even said that they understood the value of studies and at least to express talents rather than remaining idle and roaming around. I never expected this in a feedback from a kid and I had personal learnings from the day. The new addition for the year was science exhibition we were worried as of how it would go but it was greatly welcomed by the kids. Winners of Nakshatra 2014 Trichy – Bishop Heber Walsh Home receiving the throphy from Arshath and Ayyanar. Posted in Lakshya and tagged Banglore, Chennai, events, Nakshatra, Nakshatra 2014, Report, Ripples, Ripples August 2014, Trichy.